Large, stocky falcon with relatively short tail and broad-based, sharply tapering wings which, when soaring, are more pointed than in other large falcons (except Barbary). 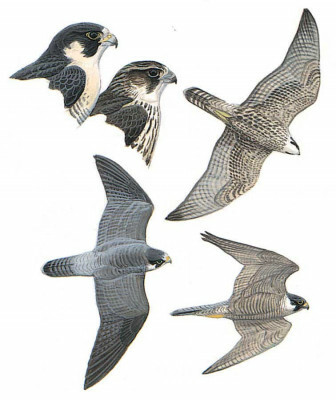 Adult separated from Lanner and Saker by black crown and bold moustache, contrasting strongly with white throat and small cheek-patch, darker upperparts, barred underparts, but gleaming white upperbreast, and plain greyish, barred underwing. Dark brown juvenile told by uniform under-wing (distinctly bi-coloured in young Lanner and Saker) and smaller whitish cheek-patch (not reaching eye, unlike Lanner and Saker). Normal flight with fairly quick, shallow, stiff wing-beats; impressive when hunting, with long fast stoops.